What do you think the following four people have in common? (A) Elton John. (B) Alan Scott. (C) Boy George. And (D) George Michael. Why, yes! That is correct, dear reader! They've all fallen in love with this comic book Published by DC Comics, in May, 2014. Why? You didn't think it was talking about something else, did you? Something about Tom Taylor and Nicola Scott, perhaps? To QUOTE Harry Houdini: 'Can you guess what I'm going to do next?'. I suppose today started out like any other day really. Red Arrow teased Jimmy Olsen about Doctor Fate's monosyllabic predictions. Batman was typing away on his big old Bat-computer. And all in all -- yeah -- same-old, same old! However, as the day then progressed, something happened to Lois, Hawkgirl and myself, whilst they were teaching me about my new Kryptonian powers. There we were, out in the bright open fresh air, when suddenly, I can hear Lois call out to me in the distance, saying, 'Look out Val. Superman and a group of his parademons are about to attack us'. And they did -- POW! 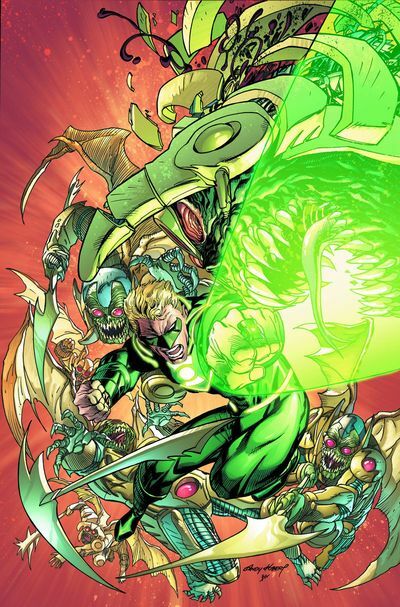 -- May Green Lantern have mercy on our souls! 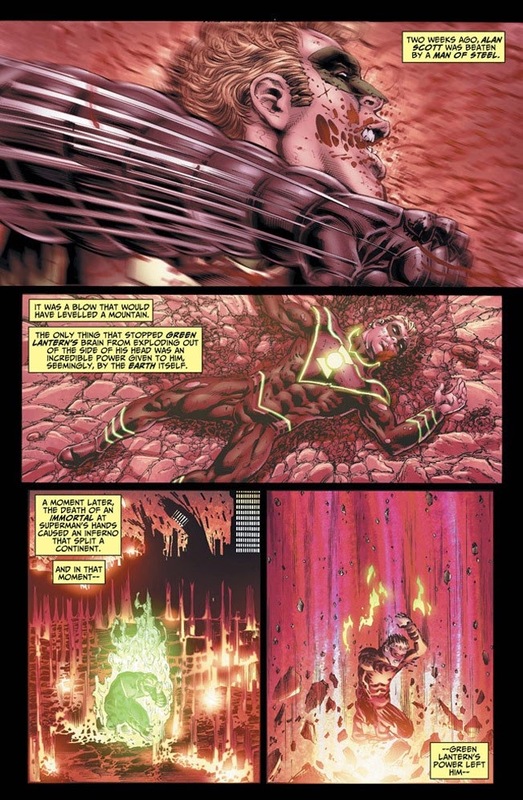 If I could only use one single word to define this issue of 'Earth 2', that word would have to be 'tease'. Yeah. I'm not pulling your leg. Simply put, tease is the perfect adjective to describe this adventure, mainly because it teased us with so many questions and answers I can't wait to hear more! For instance, is Val in fact the General Zod of this reality? What is Batman up to on his Bat-computer? Where the hell does Green Lantern think he is? What is that machine Bedlam is forcing 'The Misters' to build? Will Superman come to his senses as soon as he sees Lois? Plus how does Lois go to the can? OK. So maybe not that last one. But I'm sure you get the basic gist of what I'm trying to say about this second part of 'The Kryptonian'. It's a great tale, complemented to the nth degree by Tom's magnificent characterizations, and Nicola's bold yet expressive visuals. After this issue teased me with so many of its differentiating plot-points, I felt kind of frustrated inside myself, wondering what the hell was going to happen next, whilst also wondering why it read so quickly as a self contained story. Yeah. It was a bit of a quick read. And I would've liked it to have been more... err... more... if you know what I mean. Now what would be your first reaction if an evil Superman suddenly showed up at your front door step? Fight back? Say something stupid? Or would it be more like this 1966 classic, sung by the Spencer Davis Group, 'Keep on Running'? The only thing that springs to mind in relation with what I can compare this comic book to, is a feeling I sometimes get immediately after I step out of a very hot shower. Slightly perspired. Slightly fatigued. And totally fresh. I'm sure you know by now what I felt about this amazing adventure, folks. It's a great adventure, with a teasing story-line I honesty want to read more of as soon as possible. But because I can't do that at the moment, I thought it would be a fun idea if I could suggest to Tom Taylor a number of ways to enhance this already splendid title. Pay homage to a couple of Earth 2 celebrities from the distant past. Like a Brad Pitt styled Errol Flynn for instance. Or a Rita Hayworth styled Angelina Jolie. Have Jay Garrick look a bit more like his old self. Ditch the visor and bring back the square jaw-line. Come on. You know you want to. Try to reform the JSA again. Give them a HQ and a reason to stay together. Plus make them work as a group, and not as a band of misguided waifs and strays. In places satirize the concept of 'Earth 2'. And attempt to poke fun out of other dimensions, and what people over there might be like. Don't concentrate all your efforts on Superman and Batman, please allow some of the other superheroes to have some page time as well. Ignore everything I've just said because I've just eaten too many eggs and am about to let off a stinker anytime soon.